NEVILLE TWP, Pa. — If someone handed you a stat sheet and told you to pick out who won the game, one might assume that the Robert Morris Women’s Hockey team won their first of a two-game series against conference foe Penn State rather easily. The Colonials outshot Penn State by 14, won more faceoffs, and had more power play chances. Despite also having the puck in Penn State territory longer, Penn State hung tough, and won the most important stat of the night, the final score with a 3-2 edge over Robert Morris. The game initially broke the way that Robert Morris had envisioned. They were playing their game, and 5:33 into it, they took a 1-0 lead on a Rikkie Meilleur goal. “I chipped the puck to my center, Sarah Quaranta, she took it down, got a nice shot, and I just followed up with the rebound,” stated Mueller, the team’s captain. However, 34 seconds later, the lead was erased, and 29 seconds after that the Colonials were trailing 2-1. Penn State took that momentum and never looked back. They extended the lead to 3-1 before a late push by the Colonials made it 3-2. Still, it was not enough of a push, and the Colonials will look back at this one knowing they let a chance slip away. The first period was ultimately the deciding factor in this game. The Colonials outshot Penn State 20-6 in the period but went into the locker room down 2-1. The Colonials fought until the end, but it is safe to say the barrage of shots, with nothing to show but a losing effort on the scoreboard changed the game. The Colonials knew that Penn State plays at a much slower pace than they do. Their gameplan was to play fast, push the puck up the ice and look for odd-man opportunities. While the Colonials did find success in that regard, and both goals came on odd-man rushes, it also came back to bite them in the same way. This can be understandable, as the Colonials are a high octane, high scoring team.They average six more shots per game than Penn State and score one more goal per game than their opponent. However, Penn State showed that they can hang in and while they played at the Colonials pace, their ability to throw the Colonials own medicine against them turned out to be the big difference maker. 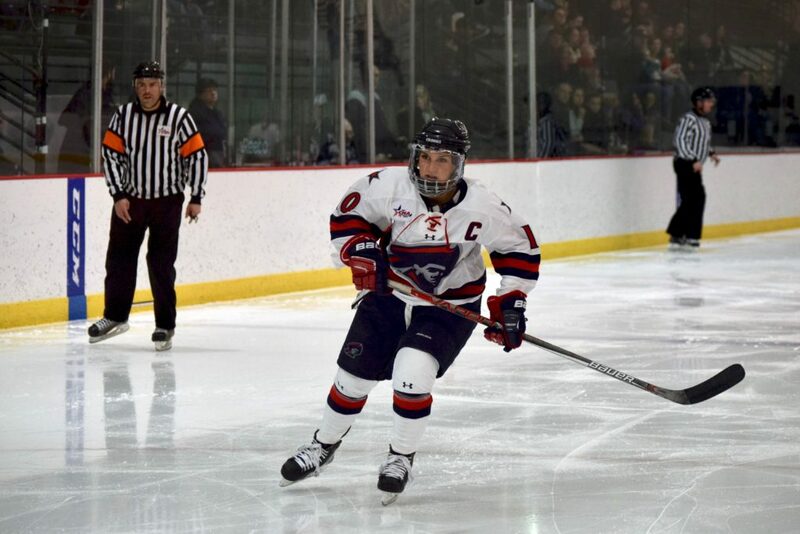 While it was the Colonials second to last home game of the season, it is never too early to flash a new look, and the Colonials did that with their first game in a new uniform. The new jerseys feature the Colonials logo, and while some of the players were really enjoying the new look, some others didn’t even notice. However, it was senior captain Rikki Mueller who hardly noticed the difference in gear. The Colonials will be wearing their new jerseys again Saturday night for the team’s last home game of the season. It will be senior night for five of the Colonials, and for the rest, it will be a chance for revenge after a tough loss tonight. Syracuse has closed the gap to two points in the pursuit of the regular season CHA championship, and with just three games on the schedule, this has turned into a potential make or break game for the Colonials. “The important thing for tomorrow is to play the same style that we have been building to play all season. Keep doing what we are doing, but start to raise the bar,” mentioned Colontino. “We need to bear down tomorrow. We didn’t do that enough tonight, but we know that every game from now on is basically a playoff game. We definitely are going to come out tomorrow with urgency.” added Gebhard. The Colonials will look to show their urgency, and extend their slim lead on Syracuse at 3:05 p.m. at 84 Lumber Arena.